This lesson demonstrates how to allow a user to drop a system folder onto a field. The folder path is then displayed in the field. Create a field that you can use to display the folder path in. If the user clicks and drags a system folder over the field then the dragData["files"] property will return the path to the folder the user is dragging. The code to deal with this scenario is as follows. 1) Create a dragEnter handler that checks if the dragData["files"] is a folder. We don't want to accept files. If the property contains a folder path then the field tells the LiveCode engine that it can accept the data being dragged by setting the dragAction property. 2) In the dragDrop handler assign the dragData["files"] property to the field. Since LiveCode paths always use slash as a path delimiter it is a good idea to format the path so that it looks appropriate for the platform your program is running on. 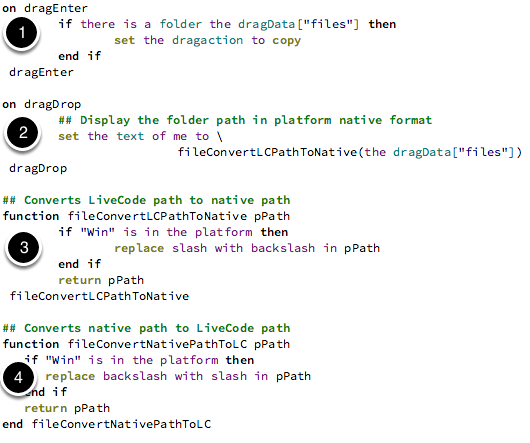 Two helper functions are included in this script that can convert from a LiveCode path to a native path (3) and a native path to a LiveCode path (4). and the path to the folder will be displayed. You may also want to take into account situations where the user is dragging multiple files or folders. In this case the dragData["files"] will contain one file/folder path per line. Prev: How do I Attach a File to an E-Mail?